So I’ve got a week off in Wales on holiday! I’ll be back at work ready to tattoo on Tuesday 4th September. I’m taking booking for throughout September apart from the odd day and so if you’re after a new tattoo, just send me an email through and I’ll get back to you. I’m still picking my emails up on my phone so it’s no problem emailing, I don’t mind, I love my job. Fancy a tattoo tonight? Super special rates! Righty-o… So as of next week (W/c 27 th Aug) I will be on holiday for a week, which means the studio is closed. However,… good news, I realise that this is very late notice, but if you happen to want a cool new tattoo, I am free to tattoo tonight. More importantly, because i’m in a super giddy mood over my hols, and if you have a cool idea (traditional or realistic type work), I will do it for just £25 per hour!!!! OR… no more than £100 if it takes longer than 4 hours. What a deal. But please let me know as soon as you can so if something needs sketching up, I have the time! First come, First served!! One place only. Today i’m popping down to the Manchester tattoo convention. If you’re anywhere near to Manchester, I’d recommend for you to go along to see some off the best artists in the industry at work. It’s at the Manchester Gmex centre and I think it’s about £20 to get in. I’m currently loving the opportunity to embrace the traditional tattoo designs. They’re good fun to do and so i’d like to do more. 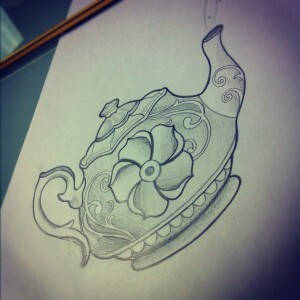 They’re proving very popular with more and more people going back to to these type of designs for their tattoo choice. With bold outlines and a strong colour palette it’s pretty much guaranteed that it’ll hold it’s own over time more than almost any other tattoo type. Oh, and they look AWESOME! So, if you want something traditional, let me know. I need more of this type of work for my portfolio. Here’s a traditional teapot i’ve just sketched up for a customer. Maybe not every-bodies ‘cup of tea’ (pun totally intended) but it serves as inspiration! Check out our friends all new tattoo studio in Manchester – Loaded FourtyFour! Loaded FourtyFour is a new tattoo and piercing studio due to open very soon to the public in the Manchester area. They have excellent, talented tattoo artists and a full time piercer and this is looking like it’s going to be an epic studio. Here’s the All seeing Eye Tattoo Lounge wishing our friends at Loaded FourtyFour the very best for their new studio! Space available this Friday the 3rd August! I have a whole free day on Friday if anyone is wanting a tattoo! Let me draw you something awesome up in my Bradford Tattoo Studio and we’ll get you nicely inked up!